It is September and the kids are back to school so cue good weather. There seems to be a staple annual spell of good weather the minute the kids return to school. I am not complaining. It is great to ease us back to the school runs when it is bright and sunny (even if a bit chilly in the morning). We are trying to take advantage and get out and about as much as we can before the evenings close in on us in a matter of weeks and we pretty much hibernate for the winter months. We were away celebrating our ten-year wedding anniversary last weekend in Castlemartyr resort (more on that to follow) and we would not have been allowed home without little gifts for the kids for being good for Granny and Granddad, who had kindly offered to babysit for the weekend. A trip into Midleton nearby and we found a Euro Giant store. Bingo. My kids (as I’m sure every other kid in the country!) loves a Euro store. Cheap tat but great for little gifts that are likely to be forgotten about within a week. And sweets – they are great for sweets too. So we decided to buy each of them a small (cheap) gift and a bag of sweets. For my littlest lady a set of teddy bear hair clips to tame her wild hair and a pack of mini lollipops – these were the requested gift! For my little man a pack of mini cars and a bag of sweets that had a picture of Mario on the packet. There could have been mashed carrots in the pack as long as there was a picture of Mario on it we knew he would be happy. 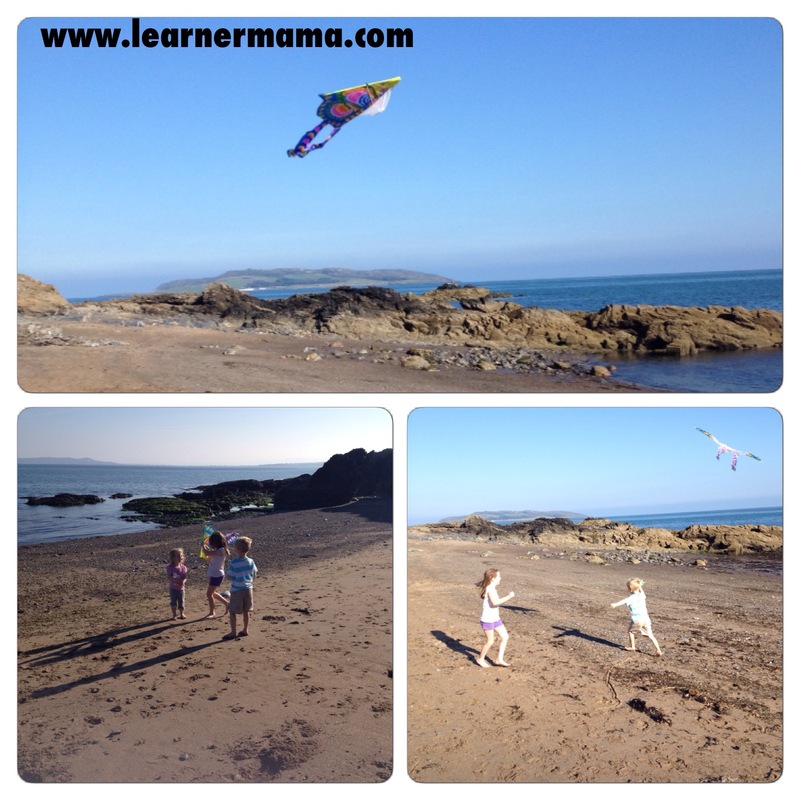 Finally for our oldest a pack of pink monkey jellies (she is my little monkey) and a kite. As soon as I saw the kite I thought it would be perfect. At 7 years of age she is at just the right age and with Autumn coming and presumably lots of windy days we could have loads of fun. Now we have never had a kite but I have very clear memories of flying a kite as a child with my Dad and siblings. It was a Fanta Orange kite. I don’t know where he got it (probably free by saving Fanta labels or something) but we loved it. 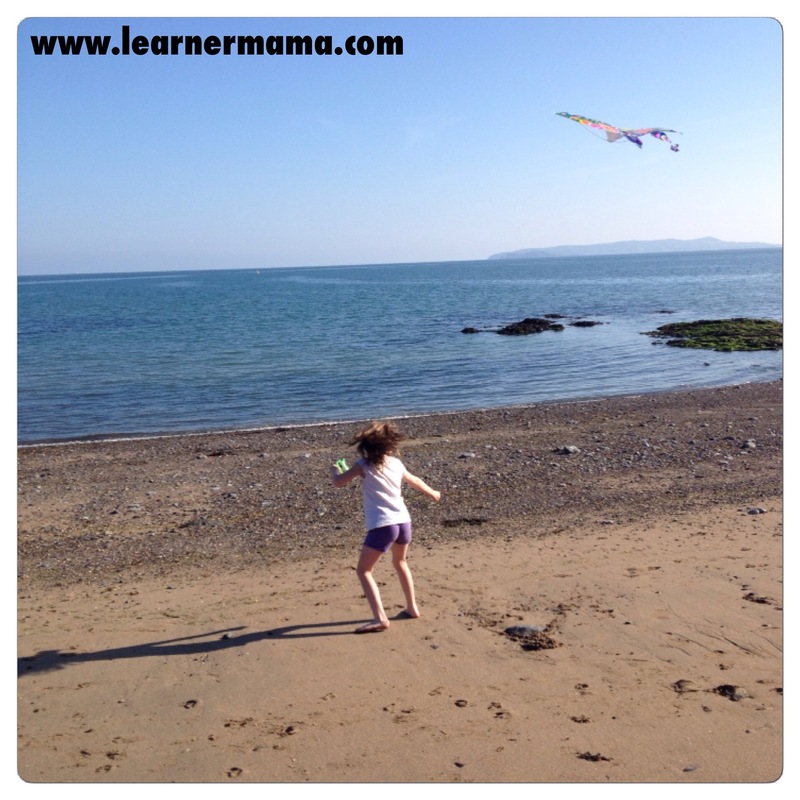 We would head to Malahide Castle and run around the grounds flying the kite. It was always a thrill. 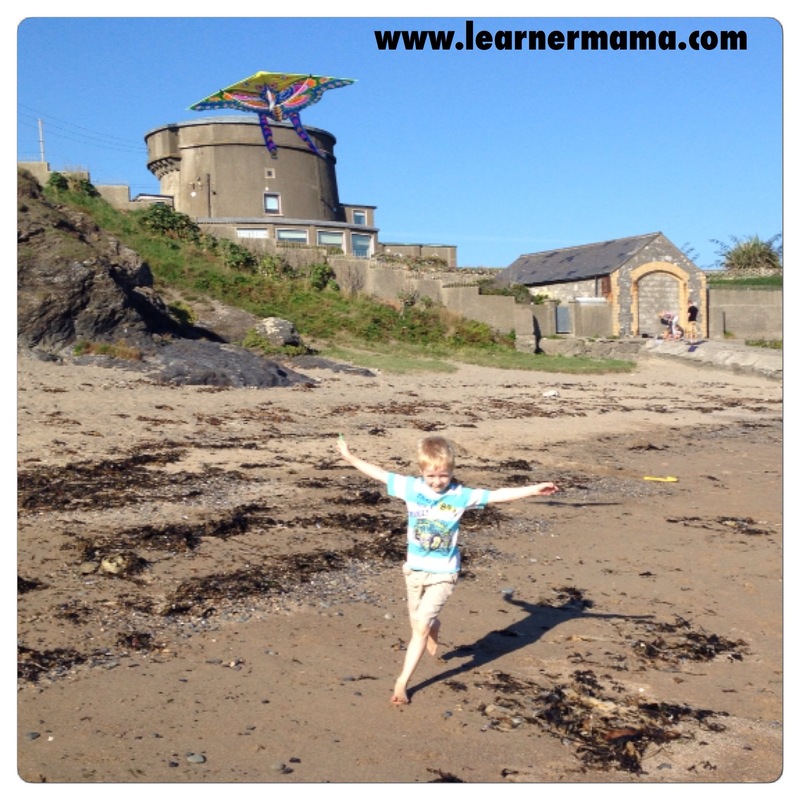 Rather than a return to Dublin to face a windy Autumn we returned to an Indian summer. It has been glorious all week but eager to try out the new kite we took a trip to the beach to see would a little sea breeze help in our efforts. We hit a small local beach and it was pretty much deserted bar a couple who were sitting facing the sea with what looked like sketch pads. To be fair the view was amazing. An artists dream spot. There was one other family but they were sitting out-of-the-way so we had the main part of the beach to ourselves. I left my oldest girl at it while my younger two threw pebbles in the sea and made sand castles. It took a few goes to get the kite airborne but with a little verbal coaching from me she managed to get the hang of it. The sea breeze was not that strong so she had to pick her take off moments carefully but she had a blast. She even gave her siblings a turn and I think we managed to entertain the artistic onlookers no end. Even after one outing I think we got our €1.50 value out of it. I am, however, imagining lots more kite flying whenever the windy Autumn days do decide to show their face (hopefully not for a while yet!). I think it’s one of the rights of passage as a child, to fly a kite, to crash a kite, and to want to do it again someday only to discover the string knotted beyond repair. tric recently posted…I can’t believe I did that. Painting with toddlers. It’s not for the faint hearted!